1 Place the onions, garlic, carrots and rosemary at the bottom of a cook-in bag placed in a roasting pan. 2 Season the ribs with salt and pepper and dust with the flour. Place this on top of the vegetables in the bag. 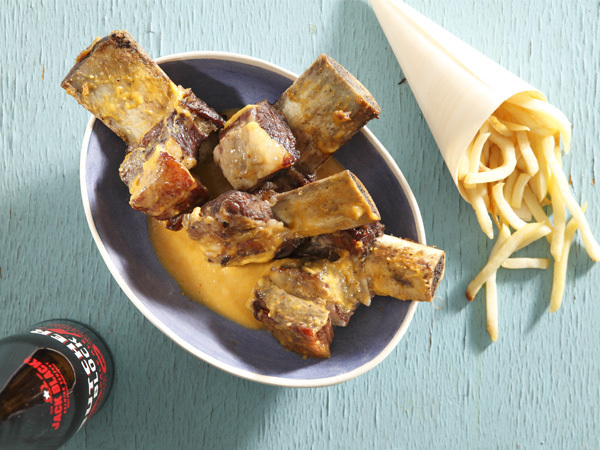 3 Pour the beer over, seal the bag and bake in the oven for 1 hour and 30 minutes until the ribs are tender and soft. Retain the sauce and vegetables. 4 Place the bag contents in a pot and add the mustard, sugar and sweet chilli sauce. Place over low heat and simmer until thick. Serve with baked chips.